iMuscle allows everyone from fitness junkies to work-out novices to create and maintain a personalized exercise program tailored to their specific needs. iMuscle is a mobile workout aid that allows single or multiple users to plan, manage and maintain a fitness or rehabilitation routine. The app, (sold separately for iPad,) opens with a recommended two-minute tour of its many personal and professional features. It also simultaneously presents a beautifully rendered 3d animated muscular portrait of a human, that can be rotated 360 degree, and viewed from anterior, posterior, lateral and other important angles. 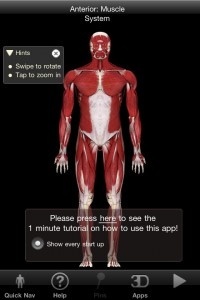 Users can then zoom-in or tap to focus on a specific muscle or muscle group, easy to locate by pin-points. Once selected a series of suggested primary and secondary exercises are presented along with stretches, in little animated videos, all contained within the app (no Internet connection required,) which makes it ideal for on the go use. IMuscle also allows multiple users to create multiple accounts, and can serve equally well as a professional trainer's or physiotherapist's case management system as it can for home use. Users can manage, track and plan multiple workouts for multiple people with ease. I seldom discuss my personal use of apps in a review, and as a rule fitness app are not my thing. But, since this app is intended for rehabilitation, not just muscle building, it is actually ideally suited to my life, so let’s play true confessions. I have a spinal cord injury and physical therapy is supposed to be a daily part of my life. 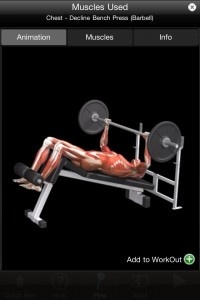 I need to build upper-body strength and prevent atrophy in my lower muscle groups. And, my husband is a former Paralympian wrestler who still lifts weights regularly. 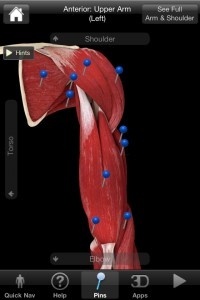 So I was able to run iMuscle through my PT and we were both pleasantly surprised to find just about every recommended stretch or strength building exercise I already do was in the app, with simple to follow animated images to help me do them properly when the therapist is not right in front of me. My husband was also able to find all his training routines, and quickly created several workouts for himself. Creating complete workouts for our two disparate needs took under 20 minutes. The GUI is intuitive and an index allows professionals to search for exactly the muscle being targeted and not only select appropriate strength building activities, but also use the app to more fully explain and demonstrate the benefits of each exercise, while creating comprehensive routines from warm-up to cool-down. The apps looks fantastic, and is sure to help motivate those looking to get in shape this summer, as much as it has motivated me to stick more ardently to my rehab. IMuscle is a high-quality, professional-grade, but user-friendly app that will help users not just work out, but do so with maximum effectiveness and minimal injury. For personal or professional use, this is a fantastic fitness tool.